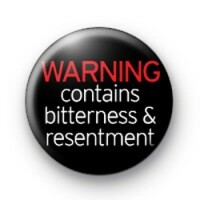 Warning Contains Bitterness and Resentment Badge in black with red and white text reading WARNING contains bitterness and resentment. This is one of our adult inspired grumpy slogan badges, perfect for those of you who are a little anti-social or sick and tired of talking to stupid people and idiots. These badges are popular with our university student customers and those of us approaching some big birthdays. We have a large selection of adult slogan badges available in our adult slogan badge category. 25mm badge made in the UK.